Early in the 20th century, a modern, accessible, airport became a necessity for any major city, and Washington was no exception. However, while there was general agreement on the need for an air hub to serve the nation’s capital, the road – literally – to achieving that goal was fraught with delays and obstacles. It would take 12 years of debate and a president stepping in for the city to finally get the airport it so desperately needed. The USS Princeton was a new naval ship designed to show the power of young America's navy. All of Washington's high society was on board one February day to witness this marvel of modern engineering. Instead, a tragic disaster left six people dead, including two cabinet secretaries, and may have altered the course of American history. The first five Metrorail stations opened March 27, 1976, so that means today is Metro’s birthday! We thought we'd celebrate the occasion with a new Metro-inspired interactive here on the blog. 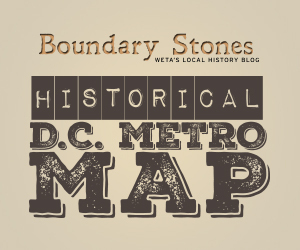 In our Historical D.C. Metro Map, we’ve re-named all the stations in the system according to historical events and sometimes quirky stories from the surrounding neighborhoods. America's Toilet, Dead Man's Hollow, Xenu's Landing... What's your stop?